When David Stinemetze was asked to blog at his former programmer job, he considered using a fake domain name. Ultimately, he registered the domain name because he liked the way it sounded. A few years later when Stinemetze saw there was a gap in the San Antonio online market that needed to be filled, he decided to break out on his own. And he realized he already had a name for his business. 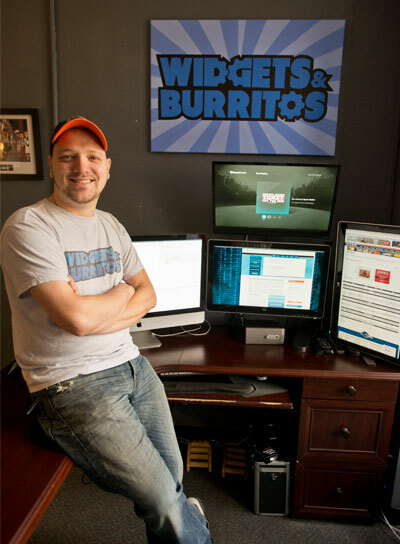 Launched in 2011, Widgets and Burritos offers programming and development efforts to agencies to make their Web products more robust. He doesn’t help to design a website, he says, or to create Web advertising. His love of all things code started when he was in middle school and continued into high school. When it was time to focus on a career Stinemetze turned to his hobby and applied to the UTSA computer science program as an undergraduate. Although his business is mostly a one-man show and keeps him busy, he recently, hired a UTSA graduate to work for him as an intern.